Dennis likes spending his time outside of science traveling, hiking, and being outdoors. He is also a big soccer fan and plays in his free time. In the lab, Dennis studies viruses that cause hemorrhagic fevers. An example of a hemorrhagic fever virus that most people are familiar with is Ebola. Dennis doesn’t work on Ebola, but focuses on other hemorrhagic fever viruses that are transmitted by ticks. In high school, Dennis was really interested in biochemistry. He initially considered a career as a biochemist but realized he was less interested in the molecular details and more interested in the big picture that areas like zoology and medicine could provide. After high school, he went straight to veterinary school where a serendipitous internship in tropical medicine sparked his interest in virology. Dennis encountered one of the biggest challenges of his career early on. He really struggled to find the right PhD programs and postdoctoral positions. Being an international student added to the struggle, and he felt left to his own devices without the mentoring he needed. In one of the lab’s recent projects, they are investigating the evolution of the virus within a tick. It took them nearly two years to optimize experimental protocols, get the ticks to the proper life cycle stages, and collect the first data set. Now that they have successfully gathered the first round of data, they can’t wait to take a look! Dennis has had fantastic experiences traveling to do field work collecting ticks, including a trip to Turkey. The landscapes of Turkey were incredible and he really enjoyed working with the scientists and local people there. To collect the ticks, he stands out in the fields and just watches ticks crawl towards them and then just picks them off by hand. For his second postdoctoral position, Dennis was at the National Microbiology Laboratory in Winnipeg, Canada. He and his peers were thrilled about the 2010 Winter Olympics in Vancouver, so they made their own version of Laboratory Olympics. They competed in illustrious events like pipette tip stuffing, and this was Dennis’s strongest event. A lot of science is about what you do and how you respond when things fail because they very often fail. Dr. Dennis Bente is an Assistant Professor, researcher, and veterinarian. 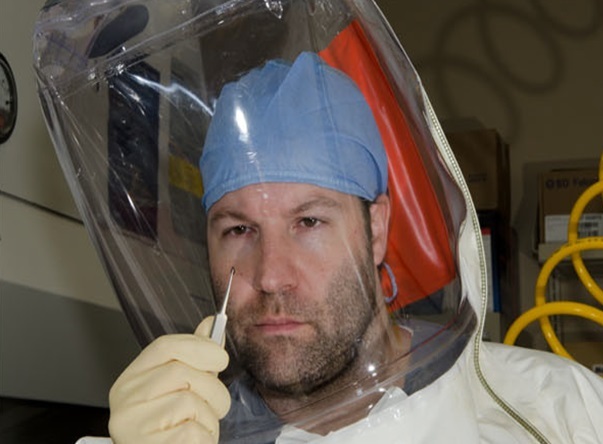 His research focus is on tick-borne hemorrhagic fever viruses such as Crimean-Congo hemorrhagic fever. What makes Dr. Bente’s research most unique is that he and his team are studying this family of diseases under maximum biocontainment conditions in the BSL4 laboratories of UTMB’s Galveston National Laboratory. Within the unique research facilities of the GNL, Dr. Bente and his team are breaking new ground in the worldwide fight against these diseases. Dr. Bente considers himself a traditional researcher with non-traditional approaches to his craft. He strives to innovate – not just in the lab, but in communicating the science, practices and findings. Working with some of the world’s most dangerous viruses is multifaceted and intricate, but he wants to break down the complexities of our discipline and ignite an understanding that breeds excitement in all audiences. When we can help people truly understand these diseases – on their own terms – our field is stronger for it. Before joining the faculty at UTMB, Dr. Bente held posts at the National Microbiology Laboratory in Canada with Dr. Heinz Feldmann and the Southwest Foundation for Biomedical Research in San Antonio with Dr. Rico-Hesse.